Fifty years ago on this day, French philosopher Albert Camus smashed into a tree and died in that most American of French cars: a Facel Vega HK500. It was not a pretty crash. Period photos show the car devoured right up to its rear axle—not altogether surprising, given the standards of crash safety half a century ago. Camus was returning home from the holidays in the Vega, owned and driven by his friend and publisher Michel Gallimard, who lost control and killed them both. The tree which claimed at age 46 one of France’s most unsettling intellectuals was rather sturdier than Camus’s belief in that great fad of French philosophers: communism. Unlike his contemporary Jean-Paul Sartre, Camus was never an apologist for the crimes of the Soviet Union or a hobnobber with Commie guerrillas: after a youthful flirt with the ideology in the 30s, he was labelled a Trotskyite and expelled from the French Communist Party, whereupon he became an anarchist and a defender of the victims of totalitarian abuse, like the Hungarian revolutionaries crushed by the Soviets in 1956. Philosophers, shmilosopers, but what about his weird ride? Some say the Facel Vega HK500 was one of the most beautiful cars ever made. These pages have certainly seen praise for this 50s love child of Jean Daninos, a marriage of French coachbuilding and big old Chrysler V8’s—but the end product is closer to Stutz Bearcats and Royales in style than to the contemporary Aston Martins it is often compared to. Nevertheless, the highly expensive coupé—ten grand in 1958—was a hit in its day, with a who’s who of celebrity owners. Most notable amongst them was Ava Gardner Sir Stirling Moss, who drove one from race to race. Facel Vega would not prove much more resilient than its most famous dead passenger: the company went bankrupt in 1964, not that uncommon with small luxury manufacturers. 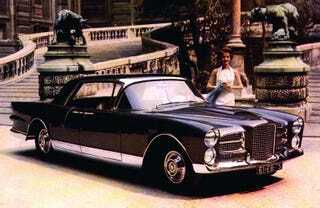 But unlike Lamborghini or Aston Martin, Facel Vega never found a financial backer to tide it over. Rather like the ones on a 1939 Bugatti Type 57C Voll & Ruhrbeck cabriolet. At least Daninos got that right.